BETWEEN THE BURIED AND ME land best Billboard debut in band history! ‘The Parallax II: Future Sequence’ enters Top 200 at # 22! 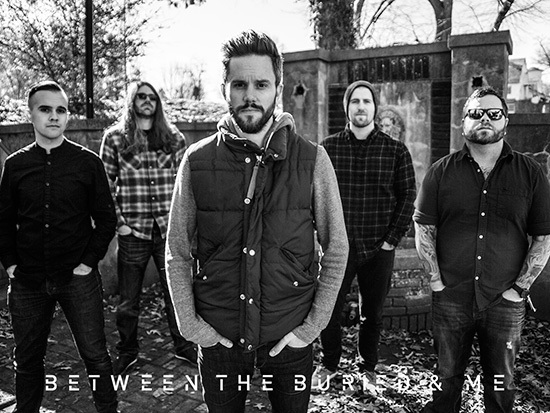 BETWEEN THE BURIED AND ME’s ambitious concept album, The Parallax II: Future Sequence, gave the North Carolina-based band their highest one week sales figure and Billboard chart position (17,102 and #22 respectively) since the band’s inception in the early 2000′s. The album also landed the #3 spot on Billboard’s Hard Music Album chart, as well as #8 on the trade magazine’s Rock Album Chart. Additionally, The Parallax II charted at #5 on Billboard’s Indie Label Album chart and at #10 on the Billboard Indie Retail Album chart. Previously, BETWEEN THE BURIED AND ME’s highest charting release was the 2009 release of The Great Misdirect, which entered Billboard at #36. Internationally the band and their brilliant album fared equally well, taking the #1 spot on iTunes Canada’s Metal chart upon release and landing at the #5 spot on the Billboard’s Canadian Hard Music Chart (#46 on the nation’s Top 200 Album chart). In the UK, The Parallax II debuted at #15 on the Rock/Metal Chart and at #30 on the country’s Indie Chart. Lastly, in Germany, BETWEEN THE BURIED AND ME took the #6 spot on the German Newcomer Chart. The Parallax II, recorded during the Spring of 2012 at The Basement Studios in Winston-Salem, N.C., was once again produced by the band and longtime creative partner Jamie King. This is BETWEEN THE BURIED AND ME’s first full-length release on Metal Blade Records, preceded by The Parallax: Hypersleep Dialogues, an EP that began the story of the two characters: Prospect I and Prospect II. A video for “Astral Body,” the first single from The Parallax II, gives fans their first look at the two characters in a visually-stunning clip. The band is currently touring Europe with a trek across Japan, Australia and New Zealand to follow. A North American tour will be announced soon.